When Jodine Alpern signed up for an educational weekend in Mexico with her church, little did she suspect that it would end with being surrounded by police, held for seven hours in detention, deported, and banned from Mexico. Eight of the eleven Austin residents who were a part of a trip organized by a local non-profit, Austin Tan Cerca de La Frontera, for Wildflower Unitarian Church and others, were deported and banned from Mexico late last Saturday night. 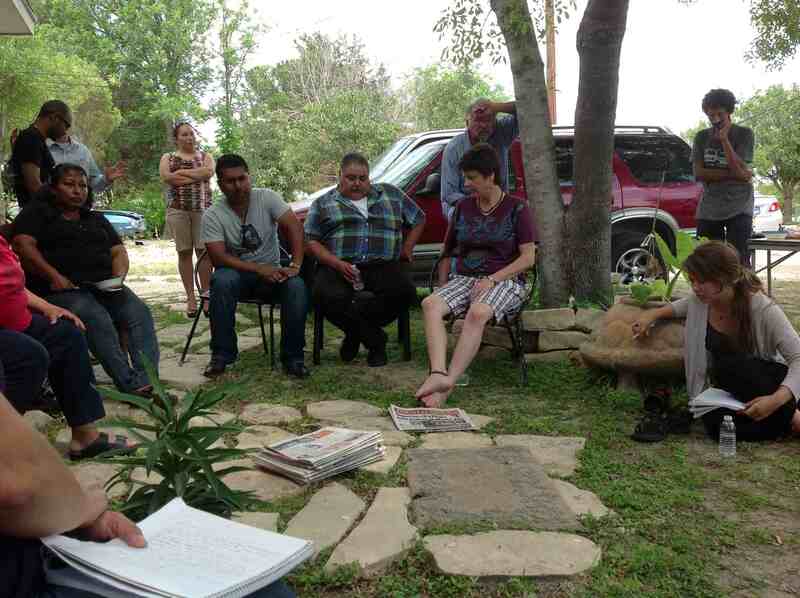 (photo above) Austin Tan Cerca de la Frontera delegation meeting with Mexican workers. Read Austin Tan Cerca de la Frontera's Press Release here. The group was in Mexico to learn about the conditions on the Mexican side of the Border, particularly in regards to working in multinational maquiladoras, large factories staffed with workers thrown out of work in other parts of their country. All went well on Friday afternoon as they visited with workers and heard from them about their working conditions. Workers shared that they normally work ten hours a day, for fifty cents an hour, in windowless factories that frequently have unsafe working conditions and sometimes even lack safe drinking water and adequate sanitary facilities. Saturday morning they visited in the homes of several workers and drove through the Maquiladora district of Acuna where more than 50,000 workers are employed. Workers told them of working for a decade without a pay raise and trying to support a family on wages that often don’t cover rent and utilities. Food prices in Acuna are often the same or higher than in the U.S. Although Mexican law allows for union organizing, those who try to do so are often fired and blacklisted for work elsewhere. Frequently, in Mexican maquiladoras, they learned, “unions” controlled by the company itself are put in place to prevent organizing independent unions for worker rights. Learning of the working condition, the delegation said they understood better why people working hard and unable to feed families on fifty cents an hour would look for work in the U.S.
After visiting with a fired worker, the group was taken to a local facility owned by a miners union, where a committee of women factory workers, had prepared lunch for them and planned to talk with the delegation. Minutes after their arrival, the house was surrounded by police holding large guns and immigration officials entered the establishment saying that they had had an “anonymous tip” about a group of undocumented foreigners. In an ironic turnabout, they checked the documents of only eight of the eleven member group, the three who were not checked were of Latino heritage and perhaps thought to be Mexican Nationals. “This is the first time having brown skin has been an advantage with authorities.” remarked one of the U.S. citizens not identified and held. Although all had U.S. passports, Authorities claimed that their papers were not in order because they did not have a “visa”, a small paper filled out when foreigners enter the country, but not asked for from visitors who stay close to the border and are in the country for less than three days. The group faced intense questioning from immigration agents about their purpose in the country and authorities ignored repeated requests from the group’s leader to contact the U.S. consulate. The eight were then taken in a van to the immigration office where they were asked more questions and when they refused to continue without advice from the consulate or a lawyer they were given a choice of two weeks of detention or immediate deportation with a ban from Mexico. Authorities refused to allow the group to see a lawyer or the chance to see any statute they may have violated. The detained group included seven women and one man ranging in ages from their twenties to their sixties. They included the minister of Wildflower Church, Rev. Kate Rohde, Ms. Alpern, a third Unitarian, two young women leading the group, , several UT students, and a computer worker. “They must be running scared to need to deport a three older ‘church ladies’ and five young students and professionals just for talking to workers.” Remarked Rev. Rohde. The fired workers had worked for PKC, a Finnish company and there is currently an international campaign to rehire the workers and have a fair election http://www.industriall-union.org/tell-pkc-to-reinstate-workers-in-mexico. One of the workers remarked to the group, “You came to learn with your ears, instead you learned with your bodies”. The delegations’ Mexican hosts stood outside the immigration offices for the seven hours they were detained and were joined by members of the miners’ union. They expressed embarrassment and concern for the treatment of the group and hoped that the treatment at the hands of Mexican authorities would not cause them to think badly about all Mexicans. Members of the U.S. group remarked that their hosts had no need to apologize, that the experience was an education both in the power of multinational companies to direct the power of the government as well as what it felt like to be subject to the arbitrary authority of immigration officials. The U.S. nationals acknowledged that their treatment at the hands of Mexican authorities was much kinder than the way Mexican nationals are often treated in the U.S. Many expressed regret at being banned from Mexico and hope to contest the action. A newspaper article in the local Acuna paper claimed the 8 were deported for illegal union activities. The paper had not spoken to the Americans or the Mexican workers. Is so sad the experience you have from part of the authorities in mexico. At least you were able to learn by experience how bad is the conditions of the workers in mexico. The problems,that the worlds face, is cause for the avarice of the political and coorporate elite, and they put divisions over the people through flags, and patriotism making us forget about our humanity, and the planet earth which have not nation or flag.